ADDED 25 October 2018: We now have a video of Aimee Lykes in dry dock. The subject of the vessel Aimee Lykes came up in the previous post and my informant Graham Read sent in a picture he took while the vessel was in dry dock in Durban. She nearly sank after running into the Aliwal Shoal at speed in October 1963 and spent six months being repaired in Durban. There is quite a lot of info about Aimee Lykes on this page. Graham’s picture sparked quite a few memories for me and I believe it is quite likely that I also viewed the vessel while she was in dry dock. Visits to the harbour and dry dock were staples of the Sunday drives I took with my dad when I was very young and I think it quite likely that we would have gone down to see the vessel after all the publicity she received. In those days, one could walk right up to the edge of the dock and peer down into it. It seemed unimaginably deep and the memory can still give me a cold shiver. Other popular Sunday drive destinations I remember were Albert Park to play on the swings and the viewing deck at Louis Botha Airport. I was a first year apprentice with R.Scott and worked on the repairs, Dennis Smith was burnt on that job when someone using a cutting torch , on the inside cutting outwards burnt Dennis who was on scaffold on the outside, doesn’t seem that long ago although it was, time certainly does fly, ship was on her maiden voyage, and was named after the daughter of one of the bosses of the Lykes Line. I went on board of the Aimee Lykes in the late ’60s with my dad who was a marine surveyor with Capt G A Chettle in the day. He did a cargo survey of sorts whilst I went down to chat with the crew – I was about 12 at the time. I befriended the Chippie (Carpenter) and elderly African -American who gave me a box full of Wrigleys chewing gum which was then not available in SA. Was quite the chap when I gave some to my mates at Prep. (D.P.H.S.). I visited quite a few Lykes Lines ships in the day all named after ladies. The company was then run by the founder’s daughter if memory serves me right. My memory is that the damage resulted from two things (a) the captain was trying to set a record time from New York to Durban, and (b) he either went too close to the Aliwal Shoal, or tried to go inside inside it, in order to pass a ship ahead of him at that part of the voyage. Maybe others can confirm whether or not my idea of what happened is correct. From what I understand, the Admiral was trying to set a record time, and when they came to the shoal there were 2 coasters – one inside the shoal, one outside the shoal, and the Admiral took his ship straight up the middle! He was retired early. Lynette’s version is correct as there were two other ships involved, however, it was also due to the fact that it was late in the afternoon and berthing was on a first come first serve basis which meant longer shore leave for the crew. I recall the incident very well as my stepfather was the ship repair manager for James Brown & Hamer at the time. I addition to that I was the idiot who tripped on a mooring ring and fell down the docks on Monday 30 December 1963 whilst viewing the ship with three of my friends. What an excellent photograph. And probably as rare as hen’s teeth. I was working in the Claims Department of John T. Rennie and Sons at the time. 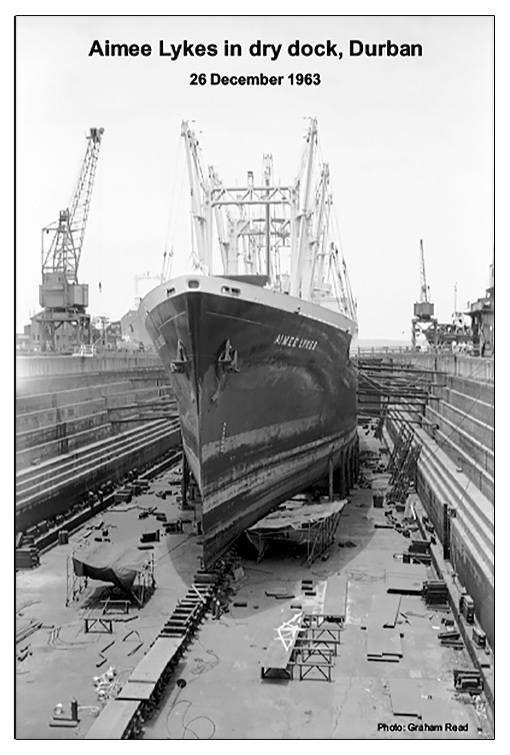 Aimee’s Owners (Lykes Bros) declared a General Average, a practice which requires owners of all cargo on a ship at the time of a casualty to contribute to costs incurred in salvaging the ship and her cargo. Rennies were appointed to handle the General Average formalities for cargo for Durban and all points north. As I recall some of the cargo was destined for ports as far north as Eritrea. You can appreciate how difficult a job this was, given the absence of e-mail, fax and quite often, even phone connections. The whole exercise was superbly administered by a lady named Pauline Turkington, with whom I worked from time to time. The exchange rate at the time was ZAR1.00 = USD 1.39 – yes, it cost a dollar thirty nine cents to buy one Rand. I took the settlement cheque down to the Shipyard and it is (and I am sure it will remain) the biggest cheque I ever will handle – as I recall ±ZAR 1.5 million, and this in the days when an upmarket house in Durban North could be bought for ZAR 25,000. She was very severely damaged – the engine foundations were lifted up by about 6″ and she was tidal in Hatches 1 and 2 as I remember. I went down into the drydock to look at her hull plating and double-bottom frames – the extent of the damage was extraordinary. It was said at the time that had she not been on her maiden voyage, the repair costs were so high relative to her value that she would have been declared a constructive total loss and would have been scrapped. There was an interesting meeting about 10 years ago between my elder son, who at the time was a solicitor with a marine practice in London, met up with the then Chief Officer of one the ships being overtaken by the Aimee when she grounded. He casually mentioned my involvement and some interesting discussions resulted, as you may imagine! My Uncle Rodney has tells me that the story in the Point yacht Club Bar in Durban (at the time) about the incident, was that three ship captains met at a pub in Cape Town and made a wager as to whom could get to Durban first. The two local coaster captains, peeved by the captain of the Aimee Lykes’ boasting, encouraged him to travel as fast as possible. The local captains passes the shoal on eiher side of the shoal and the boastful yank then drove his ship straight down the middle onto the shoal at full speed. He lost his job. I was an 11 year old in 1963 and went into the dock to see under the ship. I do have a 2 of pictures of the damage. I took them with my Kodak Brownie. I also remember someone falling into the dock around that time. My parents were in Durban in Feb 8, 1964 and have a couple slides of the ship. I am going through the slides from the 70 day tour they took for W to E Africa via S Africa. Didn’t really understand the significance of these slides until now. Very interesting story for sure. Does anyone know how long it stayed in Durban’s dry dock.